Vertex42's free Home Budget Worksheet provides a very simple solution for creating a yearly budget. It was designed to help you make predictions about your future financial situation. It contains a fairly comprehensive list of income and expense categories, and it is also very easy to customize the list for your specific use. If you are looking for printable worksheets that don't require you to have Microsoft Excel, check out the printable budget worksheet resources listed at the bottom of the page. This worksheet makes it easy to create and update your home or family budget. Customize the categories and use it for planning your family and personal spending. One of the unique things about this particular home budget is that the expenses are grouped into two main categories: deductible expenses and non-deductible expenses. Whether or not an expense is tax-deductible and how to deduct the expenses are details not addressed by the spreadsheet (ask your accountant about tax-related issues). This worksheet is based on the original Excel 2003 version, created by Vertex42 LLC and Eric Bray. You can download that original version under the "Other Versions" section to the right of the above screenshot. We also have some newer budget worksheets for you to try, such as the Family Budget planner. If you'd like a way to both create and manage your budget, try the new yearly Budget Calculator or our all-in-one Money Management Template. Why Use Excel for your Family or Personal Budget? I use Excel when working with my budget because that it gives me the flexibility to keep track of the information the way I want to. For example, I like to use cell comments to explain certain budgeted items in more detail (such as the fact that in May, there is Mother's Day and a couple of birthdays to remember). I recommend using Quicken to keep track of your expenses, or your budget projections will end up being only wild guesses. Make sure that you set up the Quicken categories the same as in your spreadsheet, or vice versa. That makes it easier to compare the spreadsheet to Quicken reports. After each month passes, enter your actual balance in the summary section of the worksheet. If the actual balance is much different from the prediction, try to figure out why, and you may want to adjust your worksheet to reflect your actual income and expenses for the month. How do I calculate my "actual balance"? What you include in the balance is up to you, but I usually just add up the balance of my checking accounts and then subtract the balance from credit card accounts. In other words, I don't include investments, retirement, or savings accounts in the balance. I treat transfers to savings as expenses for home budgeting purposes. Family Budget Planner A yearly (12-month) budget planner, but with different categories and formatting than the one listed above. Household Budget Worksheet - The monthly version of the 12-month family budget planner. Personal Budget Planner - This one is like the 12-month family budget planner, but uses a different list of budget categories more suited to an individual. Personal Monthly Budget - Like the personal budget planner, but for a single month at a time. 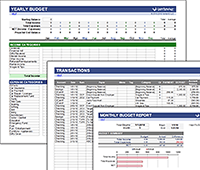 You Need A Budget - See this article for my recommendation on an excellent budget software alternative to Excel. Household Budget Management - by Eric Bray (.xls ~50 KB) - I was contacted by Eric Bray about putting his worksheet on this site, and he had some great ideas. Creating unique colors for the months helps with readability and might even make it a little more fun to use. Adding and removing categories is a little tricky with this original version because you have to be very careful that the subtotal formulas remain correct. Family Budget - by Eric Bray and Vertex42 (.xls ~50 KB) - This spreadsheets is a modification of Eric Bray's original. It's pretty much a cross between the Home Budget Worksheet and Eric's original Household Budget Management worksheet. Note that the categories are the same as in Eric's original, and the subtotals have not been removed. The main difference is some of the formatting and the addition of the projected balance section at the bottom. PearBudget - by Charlie Park - If you are looking for a more advanced budgeting spreadsheet that is still simple to use, you can try PearBudget by Charlie Park. Basic Budget Worksheet, from www.in.gov, - This is a very basic worksheet, but if you are just getting started understanding what a budget is, this may be want you want. And of course, you don't need to have Excel - just a printer.